Over a few meetings, the ailing Josephine spins a tale of old friendships at a time when World War II was looming; when secrets led to betrayal and a long-unsolved murder. She tells Brooke she is hiring her for two reasons: to protect her island and legacy from those who would despoil her land, and secondly, to help her make amends with the heirs of the long dead women who were her closest friends, the girls of The High Tide Club―so named because of their youthful skinny dipping escapades―Millie, Ruth and Varina. Even at the end of her life, Josephine seems unwilling or unable to face her past, deliberately evading Brooke’s questions. When Josephine nears death with her secrets intact, Brooke is charged with contacting Josephine’s friends’ descendants and bringing them together on Talisa for a reunion of women who’ve actually never met. 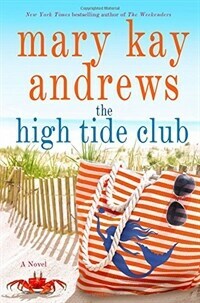 High Tide Club is Mary Kay Andrews at her Queen of the Beach Reads best, a compelling and witty tale of romance thwarted, friendships renewed, justice delivered and true love found.